Charles Turner had been involved in the 1970s station Radio Aquarius and Alistair Bates in the early 1980s station RFM. In 1983 they decided to join forces in a new venture that would become KFM. This was to be a professional operation from the start, so a company was formed, Mersey Valley Electronics, and a modern transmitter that used a frequency synthesizer was obtained. 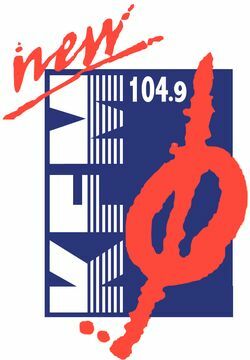 KFM was unusual in that even though it originally launched as a pirate radio station, it broadcast test transmissions for a number of weeks prior to going live. These tests were initially 2 hours and were pre recorded at Ride Music Studio’s and other secret locations on to a Revox B77 reel to reel tape recorder. The Revox was then transferred to the boot of a car which was then parked up at various locations such as a pub car park near Disley, and the tops of local hills such as Werneth Low and Lyme Park. During this time it was featured more than once on Granada Television’s “Granada Reports” news programme. 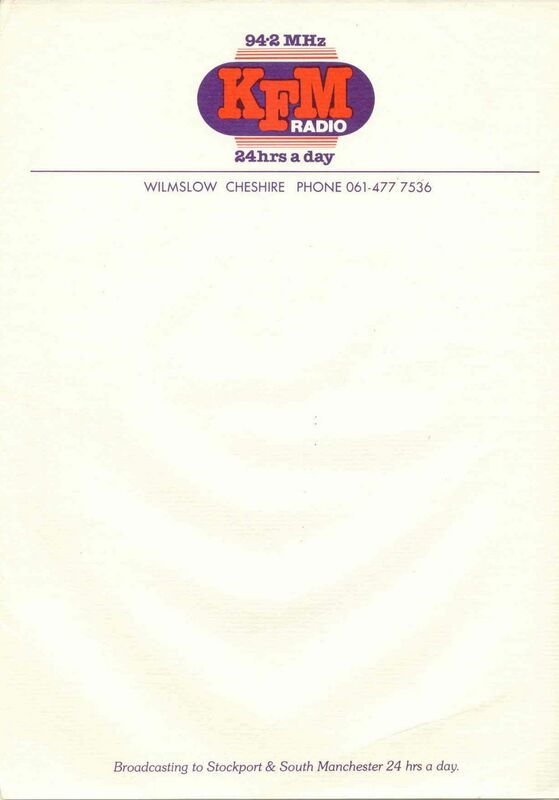 Regular broadcasts started in November 1983 on 94.2 FM from a studio on Middle Hillgate, with the transmitter and aerial at Goyt Mill in Marple. Phil Platt sang on the early KFM jingles which were written by Charles Turner with the input of Phil and Steve Ridgeway. One of its early DJs and initial programme controller was Steve Toon, who also used to present live music under the KFM aegis at the Brookfield Hotel. Its following grew rapidly and the station changed its studio location to Goyt Mill with a state-of-the-art studio. They upgraded the output to stereo output and were eventually on 24 hours a day. 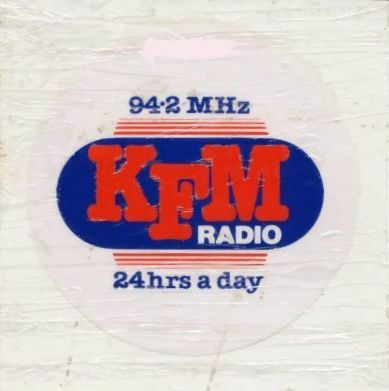 Along with Radio Jackie in London and Sunshine Radio in Shropshire, by the summer of 1984 KFM had become one of the biggest pirates in the country. They were one of the early pioneers of “Community Radio” and was the only station that played local bands. 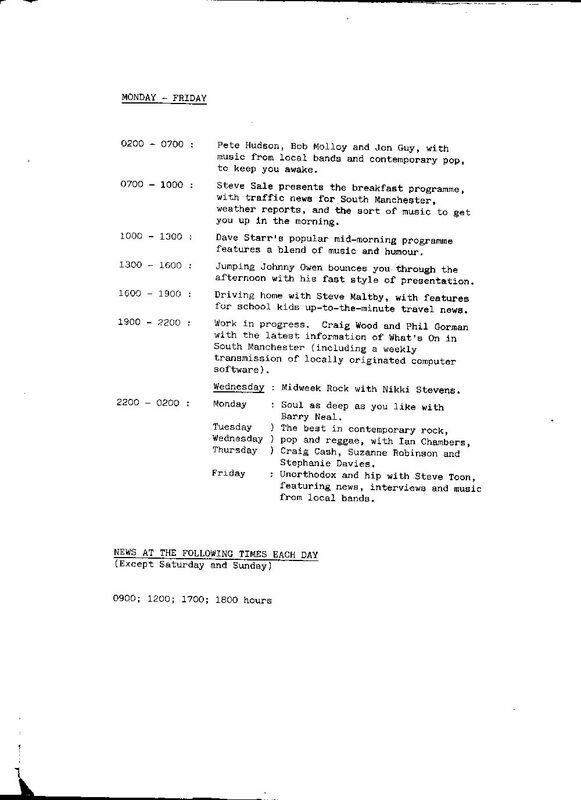 By 1984 the daytime day-time line-up included DJ’s ‘Jumpin’ Johnny Owen, Dave Starr, Simon Richards, Pete Smith, Big Al Rockwell, dodgy Kevin Webb, Rob Charles and Stevie ‘Megamix’ King (with Wilf the Weatherman) and Captain Flint to name but a few. There had been some interest from the authorities, but nothing too major, even with the introduction of the 1984 telecommunications act. However, this came to an end on the 8th November 1984, when the station suffered a major raid. The station returned, but on 1017 kHz AM, not on FM. There were even rumours that they were going to buy a ship and anchor off Liverpool! In February 1985 there was a court case resulting from the raid the previous year, which resulted in fines totally £1600 and suspended prison sentences. 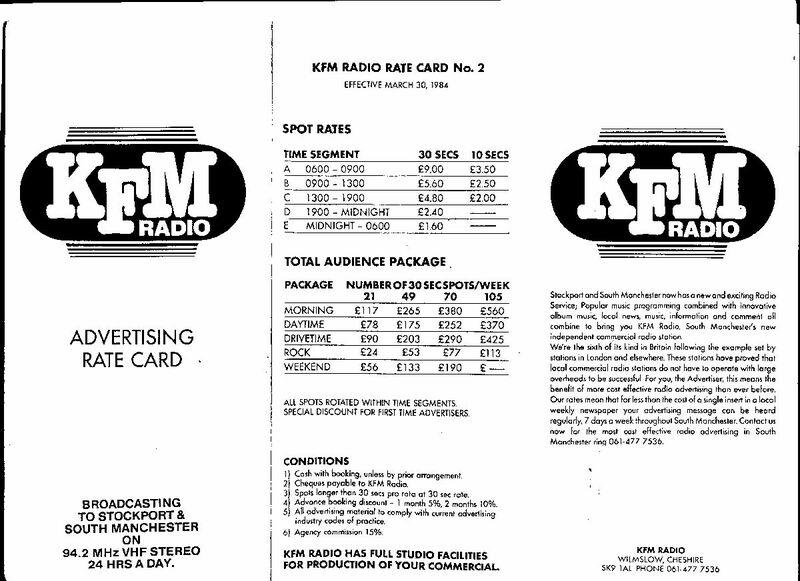 By March 1985, Sunshine and Jackie had gone, and then there was another big raid on KFM. They returned for the last time, as after another raid in April, they decided to call it a day. 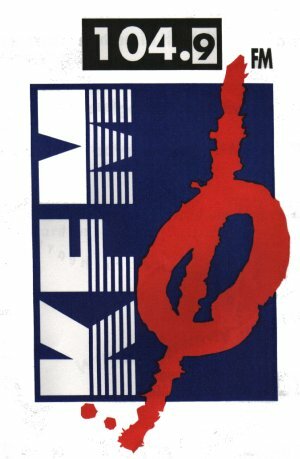 KFM were later one of the first 80s pirates to get a licence and returned to the airwaves in 1990 as a legal entity. They came on as an Indie music station, with a great line up including Terry Christian, Jon Ronson, Neil Cossar, Joe Patricks, Spence MacDonnald and pre Royle Family stars Caroline Aherne and Craig Cash. 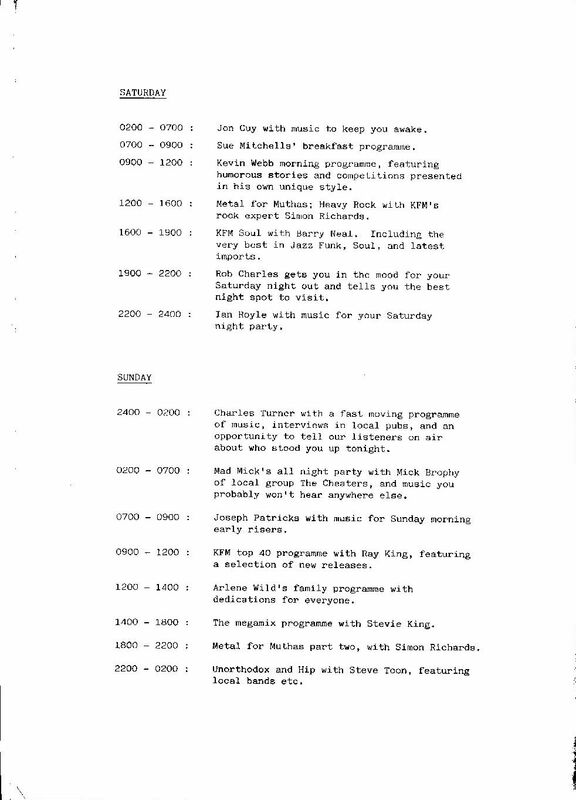 Despite critical acclaim in its legal days it failed commercially and Charles Turner sold the licence to Signal Radio. It became Signal Cheshire for a while, and following a couple of ownership changes is now known as Imagine FM.